Vancouver USA is home to culinary heavyweights (think: big name chefs and pioneering farm-to-table eateries), but it also boasts a handful of restaurants in a weight class all their own. From decadent desserts to giant breakfast foods, these restaurants are known for their massive dishes that deliver on big flavor. Dig into the Couve&apos;s biggest—and most Instagram-able—dishes! The 23-layer cake at Michael Jordan&apos;s Steakhouse (located inside ilani Casino Resort just north of Vancouver) deservedly reaps attention from foodies and Insta-gawkers, but don&apos;t ignore the garlic bread. The impressive appetizer perfectly showcases just the right level of crunch, even after being doused with a pot of creamy blue cheese fondue. Ice Cream Renaissance is known for its zany ice cream creations in Uptown Village, including the &apos;Dr. Chocolate&apos; and &apos;Mt. St. Helens&apos;. For those in search of a bigger calling, the aptly named &apos;Indecision&apos; is a custom-made creation that rarely looks the same twice. 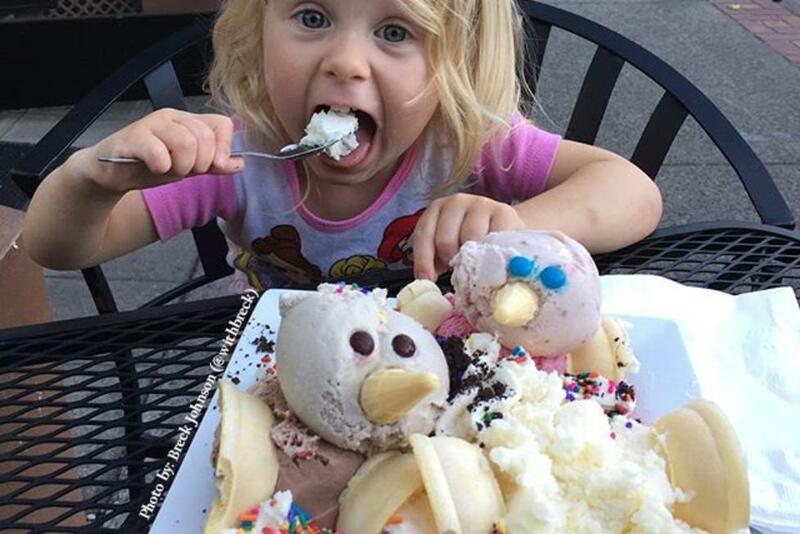 One thing is consistent though: scoops upon scoops of ice cream! The pancakes at Breakfast at Valerie&apos;s have to be seen in person in order to truly be appreciated. This East Vancouver breakfast haunt is a favorite with locals and almost everything on the menu is jumbo-sized. Best of all, most dishes can be had for just under ten bucks. With two massive, wood-fired smokers parked prominently outside its downtown doors, The Smokin&apos; Oak truly lives up to the old adage that everything is bigger in Texas. Looming largest on the menu of Central Texas-style meats and cocktails, &apos;The Fatty&apos; packs brisket, pulled pork, sausage, coleslaw, and mac and cheese in between a brioche bun that&apos;s been tasked with a serious case of containment duty. Don&apos;t forget the side dish! There&apos;s only one way to celebrate your birthday if you&apos;re a beer-lover visiting the Couve—the birthday stein at Tap Union Freehouse. The 32 ounces might send your head or stomach swimming, so pace yourself as you celebrate with your squad. Did we mention it&apos;s completely free for the lucky birthday guy or gal? My Brother&apos;s Crawfish (MBC) has earned its fair share of fans from dining denizens across the river, and its new outpost in downtown Vancouver will undoubtedly bring crowds eager to try one of the restaurant&apos;s signature seafood boils. A staple of Louisiana cuisine, the seafood boil combines any number of spices and crustaceans in a large pot, which is traditionally shared at social gatherings. Grab your bibs: MBC has announced plans to open its Vancouver location this April.